The tygers of wrath are wiser than the horses of instruction. William Blake English poet (1757 – 1827) investigating his notion of “Contraries” in The Marriage of Heaven and Hell. Believe me when I tell you that if the “horses” aren’t giving me decent instructions, you’ll see my very own “tygers of wrath” … and it’s not a pretty sight. The problem with instructions, as far as I’m concerned, is that they’re usually written by people who know what they’re doing. You might think that that’s only logical, so I’ll illustrate what I mean. 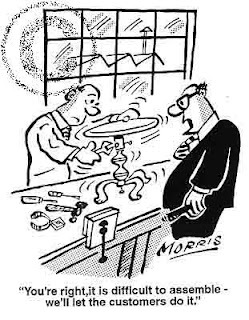 Imagine a man working for a flat-pack furniture manufacturer, let’s call him Stig, and his boss, Olaf, asks him to write instructions on how to assemble say a kitchen cabinet. Stig astutely familiarises himself with the construction and, once he’s made one up several times, he begins to write. In fairness to Stig, if you’ve ever tried to put into words even the simplest instruction, you’ll know how complicated it quickly becomes. Ambiguities abound: “turn the item through 180º.” Now you and I are immediately thinking, “do they mean horizontally or vertically?” but Stig, bless him, precisely because he already knows how to assemble it, doesn’t spot the potential ambiguity and it’s left to the customer to invariably turn it the wrong way first before finally, if you’re lucky, work out how to assemble it, despite, rather than because of, the instructions. With the aid / hindrance of the provided instructions, I’ve just assembled our, Solar Tunnel, a variation on the theme of a polytunnel. 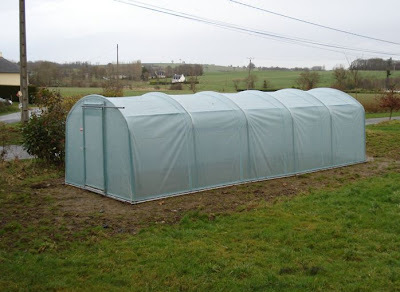 Straight away, I’ll tell you how impressed I am with the product and I think that for a first-timer, it has to be easier to construct than some other forms of polytunnel, having much of the cover actually fitted and not having to tension the cover by burying the sides in earth. The strange things with the instructions provided is that, when I read them at the kitchen table, they might as well have been written in Swahili for all the sense they made. With the components in front of me, they made slightly more sense but it was only after I’d bolted a section together, completely a**e-about-face, thus working out how I should have done it, that when I re-read the instructions, I could see what they meant, which makes it hard to be too critical. Needless to say, I made many mistakes along the way, my "tygers of wrath" being audible from miles around. I'm going to email Andrew Blacklock of Solar Tunnel to let him know how pleased we are about the tunnel—not a single missing nut or bolt and it all works really well, including the optional extra sliding doors which will help regulate Summer heat—and suggest that he could upgrade the instructions; a bit of video on the website would be good. I’m also going to ask him about taping the framework with heat tape: this comes with some polytunnels but not the Solar Tunnel, however the Solar Tunnel does have a reinforced cover, so perhaps it’s not necessary. Fun job tomorrow is to have an audit of all the seed packets we already have and order anymore we need to get the most out of the tunnel this year. Monday morning: Andrew has emailed me to say that "no anti-hot spot tape is needed or advised by the factory." Hi there, I just came across your blog and it looks like there is a LOT of interesting stuff for me to read here. It was interesting to read about the solar tunnel (having struggled with the erection of a small polytunnel before!). 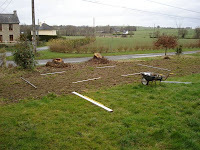 Having erected the polytunnel once (in Wales) we brought the frame over here and did it all over again! I'll need to follow the link to find out how it can be erected without having to dig trenches and hold down the poly with earth. We are British Expats now in Canada setting up a permaculture homestead and B&B and it looks as though I'll be able to get a lot of information and pointers here! The thing with the Solar Tunnel, is that it has pockets in the bottom of the sides, which are made to measure and tensioning bars slide into the pockets. "S" clips slide on and then a tensioning tool means you can clip them onto the base rail. All of this means that the devil is in the design, as opposed to a technique that one could apply to any polytunnel. I flew to Canada on 10th September that year(!) before I made a eco-no-fly pledge, and I think that it is such a beautiful country. We started off in Vancouver, whereabouts are you? That tunnel sounds like a great design. I also noted that you didn't need hot spot tape. Not that we need it here at the moment at -20deg! (although we are getting quite a bit of solar energy). We're in Prince Edward Island in the Maritimes on the East Coast. We have a very short growing season, but it's very productive. I do much better in 3 months than I did all year round in Wales. Our little 8x15' polytunnel does extend the season a bit for an extra sowing or two of peas for example. I have a Solar Tunnels Polytunnel....it is smaller than yours but enough for us. I love it! If you ask them they'll send you the method for actually fixing guttering to it! Congrats! Looks really beautiful. Hopefully lots of good food and seedlings will be flowing out of it soon. Just in time for early spring peas and such!